The Lorax, the cranky voice of environmentalism, is now telling us we should buy an even bigger car to “help” nature–that’s co-branding gone startlingly awry. McDonald’s gives away toys based on movie figures. Characters in TV shows use products with the brands prominently displayed. Athletes wear clothing emblazoned with corporate logos. We’re so used to this cozy marketing arrangement that we barely notice it anymore. The technical term for it is co-branding: two brands that exist in the same space, supporting and reflecting on each other. Sometimes it’s a more specific kind of co-branding, called an endorsement, as when one brand assures you that another brand is really, really good (think celebrities shilling for diet foods or law firms). Sometimes two companies do business together and want you to know about it–they’re engaging in partner branding, as when a credit card gives you points towards airline miles. One great example of another kind of co-branding, ingredient branding, is Intel Inside, used by computer manufacturers everywhere. The Truffula Tree seal of approval? Really? This campaign has gotten a lot of negative publicity from brand bloggers, environmentalists, Fast Company‘s Co.Exist, and even auto journalists. An organization called Rethinking The Automobile is circulating a petition to “Protect The Lorax” by pulling the “offensive” ads. And Theodor Seuss Geisel, despite having gotten his start in advertising, was ever reluctant to have his characters exploited for commercial use. I suspect he wouldn’t have thought it was a great idea to have a character, famous for protesting the abuse of natural resources, shilling for a car. There are lots of other Lorax tie-ins going on right now (including the Gallery of Regrettable Food-worthy kids’ meals at IHOP)–about 70 of them in total–so should we be more outraged (or disgusted, take your pick) over the Mazda endorsement? I certainly was. It was a combination of such blatant advertising that ran counter to the entire message, the purpose of The Lorax as written by Dr. Seuss. 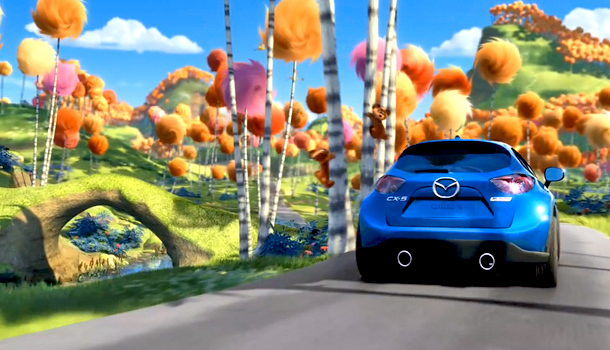 The Lorax, the cranky voice of environmentalism, is now telling us we should buy an even bigger car to “help” nature. There’s something amiss here, despite the fact that the movie continues to be a top grosser at the box office. I’ll let Stephen Colbert tell you, in Seussian verse, how he feels about it. And then you should go out and read the book and start riding your bike more. –True random fact about The Lorax: the UK audiobook was read by Rik Mayall. Author Laurel Sutton is a partner and cofounder at Catchword, a full-service naming firm.